Precious metals continued to decline in the wake of Wednesday’s FOMC report that left open the option to raise rates in December. Gold marked its lowest close in three weeks and silver settled at its weakest point in almost four weeks. Gold for December delivery dropped $28.80, or 2.5%, to end at $1,147.30 an ounce on the Comex division of the New York Mercantile Exchange. The settlement was the lowest since Oct. 8. "With gold prices peaking Wednesday at what was the floor of the 2013 crash around $1,180, the Fed’s neutral statement came like a bucket of cold water," MarketWatch quoted Adrian Ash, head of research at BullionVault. 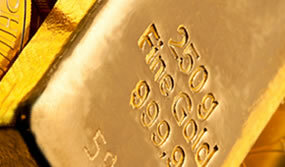 Gold prices ranged from a low of $1,152.30 to a high of $1,162.50. Prior to the FOMC statement release on Wednesday, gold advanced 0.9% to close at its highest level in just over a week. Silver for December delivery dived 74 cents, or 4.6%, to close at $15.55 an ounce. The settlement was the lowest since Oct. 2. Silver prices traded from $15.54 to $16.01. They rallied 2.7% in regular trading on Wednesday. January platinum fell $19.50, or 1.9%, to $993.30 an ounce, ranging from $992.10 to $1,004.80. Palladium for December delivery lost $15.30, or 2.2%, to $670.80 an ounce, trading between $668.50 and $683. Gold lost $31.60, or 2.7%, to $1,148 an ounce. Silver fell 21 cents, or 1.3%, to $15.82 an ounce.